Fairfax County and most of the National Capital Region are under a tornado watch issued by the National Weather Service. This is in addition to the hazardous weather outlook and flash flood warning already in effect. Read more in yesterday’s blog post about the approaching weather. A tornado watch means that you should be prepared to take action. Tornadoes are possible in and near the watch area, which are typically large areas, covering numerous counties or even states. When a tornado watch is issued you should review and discuss your emergency plans with family and co-workers, and check supplies and your safe room. Be ready to act quickly if a warning is issued or you suspect a tornado is approaching. Acting early helps to save lives! You will want to monitor the weather forecast and stay up-to-date on current conditions. 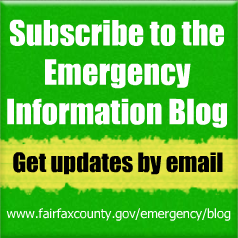 In addition, sign up for severe weather alerts from Fairfax Alerts to get notifications on your mobile device, as well as by email. Should a tornado warning be issued, take action immediately. A warning means that a tornado has been sighted or indicated by weather radar. There is imminent danger to life and property. Move to an interior room on the lowest floor of a sturdy building. Avoid windows. If in a mobile home, a vehicle, or outdoors, move to the closest substantial shelter and protect yourself from flying debris. Fairfax County is expected to encounter some severe weather throughout the afternoon and evening tomorrow Friday, April 19. Because of the expected heavy rains, coupled with the strong winds that make flash flooding possible, the National Weather Service (NWS) has issued a Flash Flood Watch from noon Friday until 5 a.m. Saturday morning, April 20. According to the NWS forecast, the expectation is two primary periods of weather. The first is likely to occur during the late morning and extend into the early afternoon. During this time, isolated thunderstorms will begin in the area and may be strong in nature. Rainfall amounts of a quarter to a half inch are possible during this first round of storms. The main storm front is expected after 4 p.m., with the most severe weather after 8 p.m. This line of thunderstorms may be severe, with 1.5 to 2 inches of rain possible across the county. The compounding storms may result in as much as 3 inches in some isolated areas, primarily in the northwest of the county. Along with the rains, these storms will bring high winds of 11 to 15 mph sustained and gusts as high as 30 mph. In addition, some hail is possible. According to the Centers for Disease Control and Prevention, over half of all flood-related drownings occur when a vehicle is driven into hazardous flood water. The next highest percentage of flood-related deaths is due to walking into or near flood waters. People underestimate the force and power of water. Many of the deaths occur in automobiles as they are swept downstream. Of these drownings, many are preventable, but too many people continue to drive around the barriers that warn you the road is flooded. Whether it is a homeowner planting a tree or erecting a fence or a professional contractor building a highway or a strip mall, preventing damage to underground utility lines when digging or demolishing is a must. Allow the required time for marking. Respect and protect the marks. There is no cost to notify Virginia 811 when you call or go online at va811.com to request the marking of underground utility lines. 811 can be reached by phone Monday through Friday, 7 a.m. to 5 p.m., except on legal state and national holidays. An emergency notification service by phone is available 365 days a year, 24 hours a day, as is online service for most digging projects. his week, April 14-20, is National Public Safety Telecommunicators Week. Every year during the second week of April, the telecommunications personnel in the public safety community are honored. This week-long event, initially created in 1981 in the Contra Costa County Sheriff’s Office in California, is a time to celebrate and thank those who dedicate their lives to serving the public. It is a week to recognize and honor the hard work and dedication of public safety telecommunicators. Here in Fairfax County, the Department of Public Safety Communications (DPSC) – the county’s 9-1-1 Center – has several events to recognize the first of the first responders, including the agency’s 14th annual DPSC awards ceremony. Fairfax County’s public safety telecommunicators answer approximately 1 million calls per year requesting public safety service and dispatches units of the Fairfax County Police Department, Fire and Rescue Department and Sheriff’s Office. 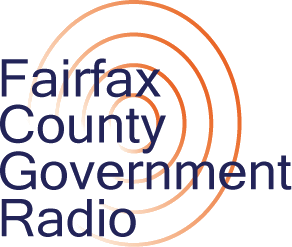 In addition to Fairfax County, DPSC is the designated 9-1-1 public safety answering point for the towns of Herndon and Vienna and the City of Fairfax, located within the County. DPSC is a nationally recognized public safety communications center, the largest in Virginia and one of the 10 largest in the United States. Hopefully you won’t need to call or text 9-1-1, but you can rest assured that the dedicated staff of call-takers and dispatchers are ready to assist 24/7, 365 days per year. For more on 9-1-1, visit www.fairfaxcounty.gov/911. All lanes of southbound I-495/I-95, prior to South Van Dorn Street, are closed due to an overturned tractor trailer on fire. In addition, all lanes of northbound I-495/I-95 are also closed due to debris in the roadway. A tractor trailer struck the jersey wall on the south bound side (inner loop) and spilled part of its load into the north bound side (outer loop). Public safety officials advise that these lane closures are expected to last an extended amount of time. Consider remaining at work or home or staying off of the interstate. Commuters should avoid the area and seek alternate routes. If you use neighborhood streets, please remember to not speed.